During a site safety inspection, one web sling belt was found to be damage stored at the Storeroom (see photo below). 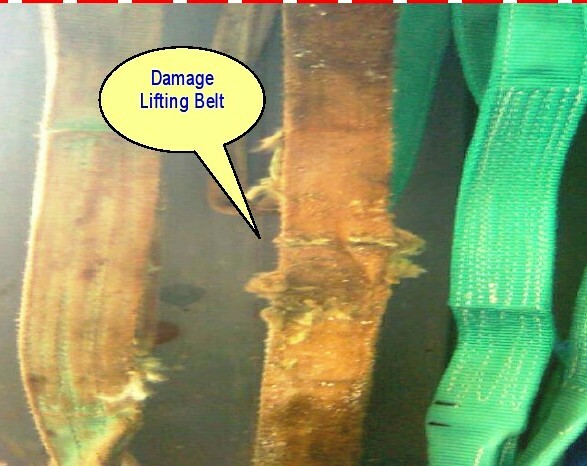 It was reportedly that the damage web sling belt was using to lift a weight of 2 tonnes. If it has not been checked or noticed, it may have resulted in serious accident and can caused severe damage to the equipment, property and injury or even fatal or death to workers. The issue was raised immediately and the damage web sling belt was remove and thrown out from the site. Here, the store keeper failed to comply with strict inspection or checking process. All lifting belts / slings must require strict inspection/checks prior using it. Defective slings are never allowed to be used or stored in an active store. Toolbox talks must be conducted to communicate this issue. All lifting equipment to be checked by approved third party/responsible person to be desginated internally to inspect all slings before use / color coding option should be introduce to EHS Management System to enforce regular inspection. 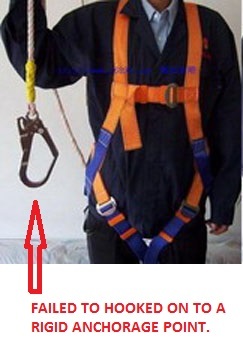 Daily rigger inspections are necessary to check the condition of the slings. Nylon strops that are frayed or damage (as shown in the photo above) are to be quarantine, remove and/or cut in such a way they are not able to used it. In a recent incident, a worker was given a task to charge a 12V car battery in the battery charging area. During the charging process, unexpectedly the battery exploded splashing battery acid into the worker's face. Immediately, his face and eyes were rinsed with clean fresh running water at the eye station and taken to the site male nurse for initial treatment. Afterwards, he was sent to hospital for proper examination. So far, there was no serious or permanent injury sustained during the incident. Q: Why did the battery explode? 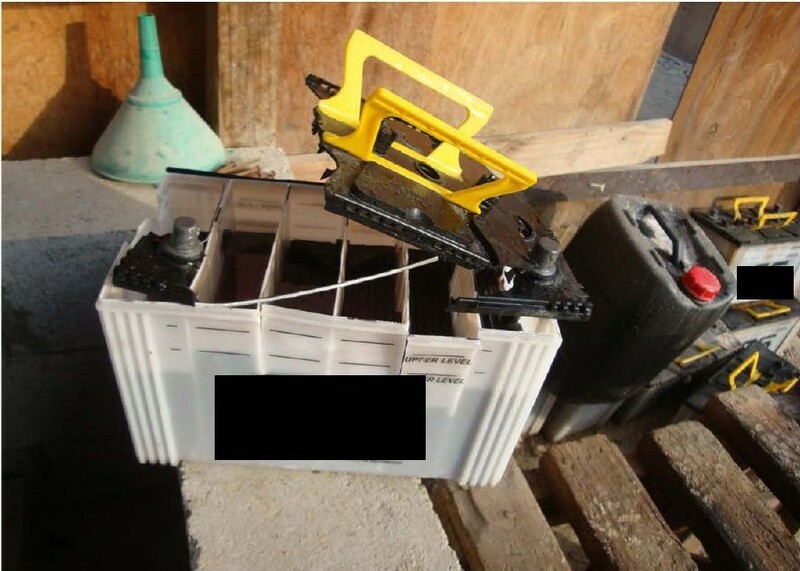 A: It was revealed that the battery cell caps were not remove during the charging process, which resulted in a build up of gas causing an "explosion". All battery cell caps shall be kept open while charging. Only competent persons are allowed to enter the battery charging room/area. Ensure that all risk assessments are regularly checked and updated. Always wear proper PPE (e.g eye and face protection) while entering the battery charging room/area. "Battery charging room/area must be designed for the purpose. Correct ventilation, warning signs, NO smoking signs, eye wash station, spill kit, fire equipment and emergency plan MUST be all in place. Shelving where the batteries are charged and surface should be non-porous in order to prevent it becoming sodden and enable correct clean up of spills. 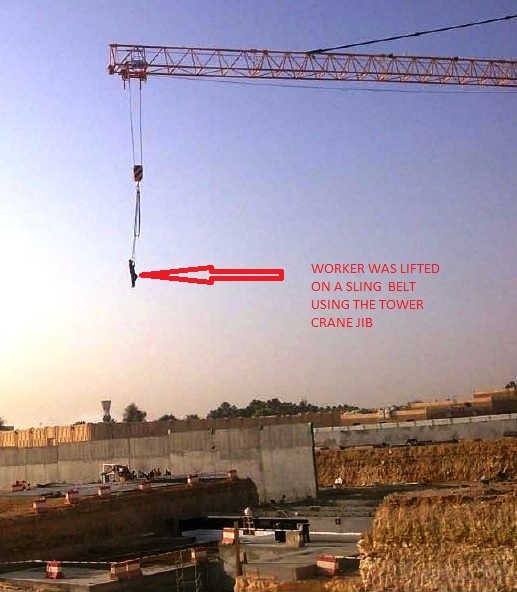 Above photo shows a worker was lifted on a sling belt with the help of the tower crane jib moving him from one site to another. Apparently, this maneuver is extremely dangerous and if this person had fallen it would have resulted in a fatal accident. It was fortunate that no accident or injuries resulted. It was also found out that the lift was undertaken without the knowledge or consent of the site foreman. This type of lift is PROHIBITED. All crane operators must be reminded of their responsibilities for safe lifting. Tool Box Talks must be given to all employees. A full review of the way personnel moving around the site must be undertaken. "WORKING WITHOUT SAFETY IS A DEAD-END JOB". On a construction site highway project, concreting is going at a certain level, pouring concrete on the final layer of a box culvert wall. 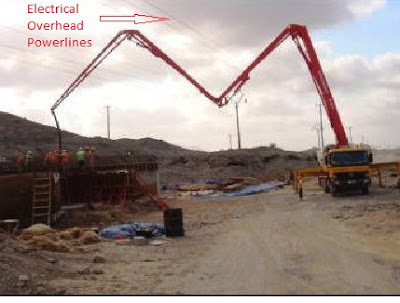 The operator of the remote control failed to take into account that he was operating directly underneath a 33kV electrical overhead power lines while moving the boom of the concrete pump. As he elevated the boom it came into direct physical contact with the power line. As a direct result the worker who was supporting the hose was electrocuted. The failure of this incident are very wide and range. It appears there was NO safe system of work in place for this highly hazardous activity. NO measures have been taken to highlight the presence of the power lines and their limitations to the works. Despite of so many workers were in that area at that time, nobody have seen the power lines??? Someone have seen the power lines but failed to address the hazards. this indicates an entirely negative safety culture. There is a need to raise awareness at all levels in the organization and to ensure that all persons are well trained in health, safety and environment measures needed in respect of each task. Failure to plan the work and identify the risks associated with working under live overhead power lines. A collective failure on the part of all workers in the vicinity at the time of the accident to recognize a dangerous situation arising. Absence of supervision by a competent person during the course of the work. A failure to put a goalpost in place to restrict the height to which the boom could be raised or a warning label/noticed. A full and suitable risk assessment of operations under live overhead lines is to be carried out. 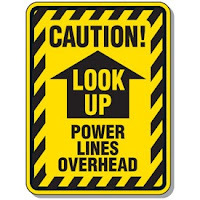 All personnel are to be full briefed on the dangers of working underneath electric power lines and precautions must be followed and what has to be done in the event of emergency or accident. These operations are supervised by a competent person. Minimum clearances in respect of each voltage must be established and goal posts and barriers put in place as appropriate. Assume that all overhead power lines are "LIVE". Establish maximum height & vertical reach of all plant and machinery. 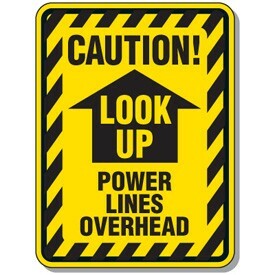 Ensure that the maximum working height for working under each span of overhead lines is made known to all operatives. The minimum clearance for plant & equipment operating under voltages of up to 33kV is 5.2 meters. If the work is to be undertaken over a long period of time it may be advisable to consult with the service provider and arrange for overhead power lines to be diverted for the duration of the works. Erect goalposts and barriers to ensure that plant & equipment are restricted to a safe height. A contractor working at the site installed a new temporary supply from an "Existing DB Panel" to provide power to their temporary site office. As shown in the above photo, the electrician positioned the new cable directly behind the bottom left hand side screw fixing point for DB cover. By the time the work has been completed he closed the panel and everything went fine. Two working days after, another MEP contractor has been deployed to site to solve some lighting issues. Their electrician opened the existing DB Panel, troubleshoots and make some wiring modifications without requesting first a Permit To Work prior commencing his activity. When the electrician finishes his work, he placed the cover back on the DB Panel and began to insert the screws. 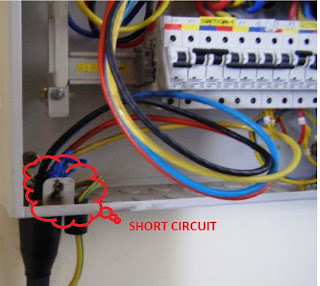 When inserting the bottom left hand screw (which was incorrect type of screw), it get contact with the cable (which is live , 240V supply), damage its insulation and causing a short circuit and loss of power. So far, the electrician was okay and no injuries reported. No Permit To Work (PTW) was followed. Location of the new cable is wrong and poor choice. The electrician uses incorrect type of screw to fix the DB cover. No inspection and approval has been made after completion of work prior switching the power supply back to live. Supervision and quality of work was poor. Upon completion of work, a qualified Electrical Engineer should inspect the work for approval. All contractors will carry out Tool Box Talks in relation to this incident immediately to all employees. The cables should not be positioned where there's a possibility to get in contact with screws or sharp objects that can damage the cables. Only correct type of screws MUST be used. All contractors must inspect any item of equipment they intend to work on prior starting their work and inform the main contractor if there are any issues. Workers should always be aware of the hazards involved in modifying items of equipment. A task specific risk assessment and safe method must be followed at all times. Regardless of the length of task a Permit To Work must be requested always for any electrical works. All panels must be electrically isolated and remain isolated until the work is completed. All work must be supervised by a competent person. The worker was given a task to install a handrail on the scaffolding located at 2nd floor of the under construction building structure as it was left exposed after the removal of the cantilever handrail. 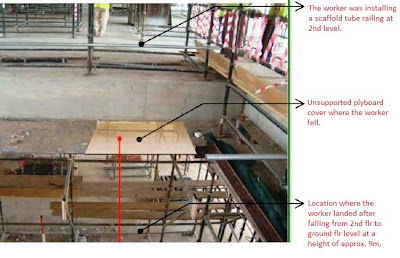 He was working alone at that time and while installing and fixing the 21 ft long scaffolding tube straddling the midrail of the cuplock scaffold formwork, he lost his balance and fell forward over the leading edge onto the unsupported plywood which gave way causing him to fall to the ground floor slab. He sustained a fracture to the back of his right wrist. 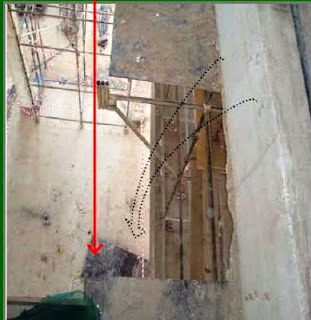 In this incident, the worker was still considered as "lucky" as far as the significant height is concerned he had fallen could have led him to more serious injury or even fatal. 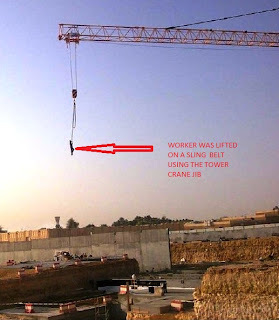 The worker despite using the full body harness "FAILED" to secure himself. Sequence of work was incorrect. The correct sequence shall be like this: The handrail on the 2nd floor should have been installed prior dismantling the cantilever. Insufficient and inadequate instruction and information. Review the work method of statement, risk assessment and communicate to all supervision with acknowledge signatures. Planned task observations to be frequently carried out to identify incorrect sequence of work to ensure safety at all times. Initiate day to day safety hints & tips and communicate it to all supervisors and workers with instructions. Toolbox talks to be scheduled with emphasis on the responsibility for an individual to secure his harness in a fall risk position. Conduct training regarding all aspects of the safety harness including inspection and utilization. "Competent supervision on all given tasks. Risk of the task to be discussed with the worker prior to the task commencing".